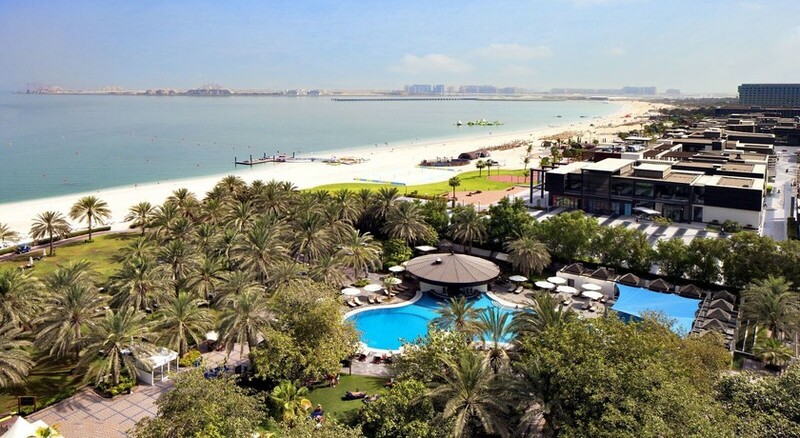 Sheraton Jumeirah Beach Resort is a five-star family-friendly luxury resort nestled in Dubai’s famous beach area. The property is rather close to The Walk, a magnificent promenade, and is walkable from the Dubai Marina, which is usually lined by luxury yachts and dhows. Set on 10,000 sq. m of sprawling lush landscaped gardens with palm trees and pools, the hotel offers all modern guest amenities along with warm Middle Eastern hospitality. For those looking at a relaxing beach holiday amidst luxury, with excellent views of the Dubai Marina and The Walk and wide range of options for water sports in the warm waters of the Arabian Gulf, then this is an excellent choice of accommodation. 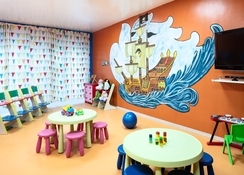 The resort holds something for every member of the family—kids will stay occupied at the Kid’s Club with exciting activities, there is an Armonia Spa and Turkish Hammam to soothe your frayed nerves and facilities for multiple sports. Sheraton Jumeirah Beach Resort is located right on Dubai beachfront, right across the lovely promenade The Walk. The Emirates Golf Club is 9km away. The Palm Jumeirah archipelago and the indoor slops at Ski Dubai are both 14km away. The resort is 36km from the airport. The modern luxury resort has 256 opulent guest rooms and suites spread over 10 floors. The rooms and suites designed in modern décor come with free Wi-Fi, minibars, tea/coffeemaker and flat-screen TVs. Some rooms offer gorgeous Gulf views. The guestrooms come in categories like Standard, Club, Junior Suites, Executive Suite, Garden Suite and Royal Suite. The suites have separate seating areas and may include upgrades such as private check-in and access to lounge. The resort has a lounge with restricted entry and nine fine dining restaurants that serve cuisine ranging from Chinese to Mediterranean. While the Palm Garden is an all-day restaurant that serves international cuisine, the Peacock restaurant serves delicious Chinese fare and the Grill restaurant is for fresh seafood and Australian streaks. 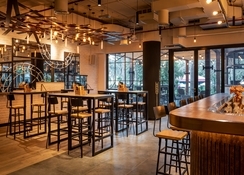 There are several bars serving alcoholic and non-alcoholic drinks – the Moods bar, the Azure pool bar and the Beach Bar. 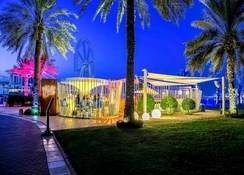 The Sheraton Jumeirah Beach Resort offers various recreational activities such as beach access, a well-equipped gym, an outdoor pool and a spa offering several exotic massages and therapies. Water sports are available (at a charge). There is a lovely lounge where guests can chill while smoking shisha. Guests may also take a delightful stroll along The Walk, a lovely promenade of 1.7km, dotted with lovely cafes, restaurants, and boutiques. We hereby informed that the Beach Lounge “Bliss” will be closed until the 15th of July 2018 for renovation. A lternatively they have their Football@Sheraton tent open until the 15th of July 2018.